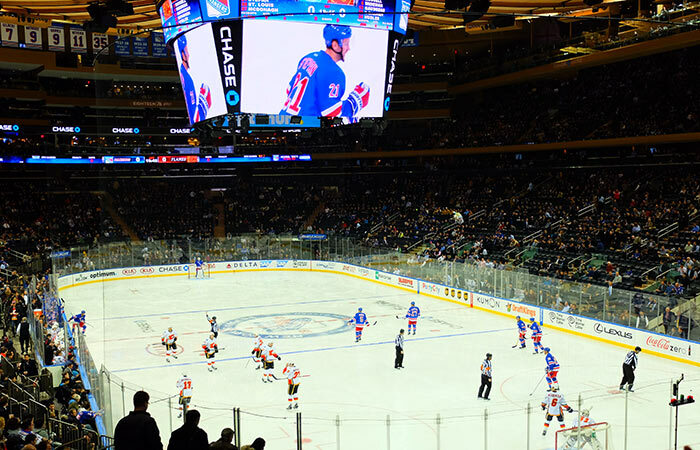 Seeing NHL ice hockey in New York is an entertaining night out for locals and tourists alike. The city has two excellent ice hockey teams and even New Jersey competes in the National Hockey League (NHL). If you want to enjoy a real American experience during your New York trip, going to an ice hockey game is definitely a good option. On this page, you’ll read all you need to know about ice hockey before going to a game. New York has two ice hockey teams: the New York Rangers and the New York Islanders. Madison Square Garden in Manhattan is home to the Rangers whereas the Islanders play at Barclays Center in Brooklyn. You can also choose to go to a New Jersey Devils game. The Islanders-Rangers rivalry is unofficially called ‘The Battle of New York’. Eric’s Tip: The New Jersey Devils’ stadium is further from Manhattan than the other two stadiums and can’t be reached by subway from New York. That’s one of the reasons why it’s better to purchase New York Rangers tickets or go and watch an Islanders game. Although New York Islanders tickets are usually cheaper than those from the Rangers, the Rangers remain New York’s top team. The ice hockey season takes place from October through April. The pre-season starts in September and the playoffs are held in April and May. The finals take place in June. Ice hockey is a fast physical sport with lots of action and excitement from the crowd. The speed of the game makes it great fun to watch for the entire family. A game is always played between two teams that usually consist of five players and one goaltender. The game consists of three periods of twenty minutes. To score points, each team must shoot a puck into the net of the opponent. Since the clock only runs when the puck is in play, the game usually takes a lot longer. An average game takes up to two or two and a half hours. Substitutions are permitted at any time and occur very often. The playoffs are games played by the top competitors at the end of the season. Tickets for the playoffs are usually more expensive than tickets for games during the regular season. The New York teams haven’t always been successful, but over the last years, both the New York Rangers and New York Islanders repeatedly managed to make it to the playoffs. The team that wins the playoffs will be handed the Stanley Cup. This championship trophy is awarded annually since 1893. The New York Rangers have won the Stanley Cup four times, as have their rivals the Islanders. Eric’s Tip: It’s fun to watch an ice hockey game because the game is so dynamic and fast-paced. There’s always a great atmosphere and good food. Make sure you don’t buy tickets for seats in the back of the stadium as it will be hard to see the puck! Don’t forget that it’s ICE hockey, so it can get chilly in the stadium.